Imbalance in rotating machinery components causes high vibrations and leads to unnecessary wear. Balancing your rotating equipment will prevent vibrations and increases the machinery lifetime. Ever since our founding, balancing is one of the spearheads of the company. Vibrations can cause construction parts to loosen. This increases the risk for disintegrating foundations, failing electric switches and breaking lines. Imbalance can significantly reduce the operation safety of a machine. 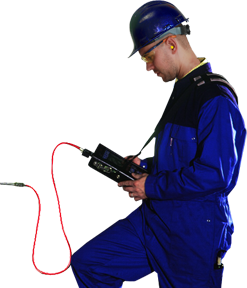 Accurately balancing and maintaining your machinery will therefore increase the safety of your employees. Van Geffen VMS has the knowledge, equipment and skilled employees to balance small, large, light and heavy machine parts. We do this as well onsite as in our well equipped workshop. Imbalance in a rotor can be divided in roughly three kinds of imbalance: static imbalance, couple imbalance and dynamic imbalance. The "dropping" of eg. 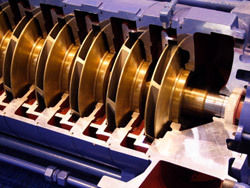 a stopped, impeller is an example of static imbalance. This is the imbalance force that is already present in a non rotating machine. This imbalance can be resolved with a balance correction in only one plane. When this static imbalance is resolved with the application of a balance correction in another plane, then a so called couple imbalance comes into existence. In a non rotating rotor, these weights will balance each other out but when the rotor starts rotating then the opposite forces will result in a rotating couple of forces. In practice almost every rotor imbalance will exist out of a combination of a static and couple imbalance. The combination of the imbalance forces is referred to as a dynamic imbalance. Van Geffen VMS has all the necessary knowledge and equipment to resolve all kinds of imbalance.